Robert B. MacKay, editor. Gardens of Eden: Long Island’s Early Twentieth-Century Planned Communities. New York: W.W. Norton & Company, 2015. Copyright by the Society for the Preservation of Long Island Antiquities. Pp. 303. Illustrations, index. ISBN: 9780393733211. Hardcover, $65.00. We’ll go and live the simple life…. Scholars of Long Island’s leading significance in American residential architecture will be very pleased with this important new contribution to regional housing history. The Society for the Preservation of Long Island Antiquities and its director emeritus, Robert MacKay, have previously provided essential works on the area’s country house phenomenon (Long Island Country Houses and Their Architects, 1860-1940, also edited by MacKay, 1997), its impressively influential forays in contemporary architecture (Long Island Modernism, 1930-1980, by Caroline Rob Zaleski, 2012), and a host of other related topics on the built environment. Gardens of Eden explores the phenomenon of residential park building that resulted in the production of more than three dozen planned communities in Queens, Nassau, and Suffolk counties, from the last decades of the 19th century through the late 1920s. Popular historical accounts have tended to ignore the story of these Progressive Era middle class garden suburbs, while primarily focusing on two much more well-covered historical housing movements in our area: the proliferation of estates for wealthy residents, which impacted every community on Long Island, or the sudden, dramatic post-World War II exodus of white working-class ethnic New Yorkers for Levittown and other affordable housing alternatives in Nassau-Suffolk. This new book proves that there is an important intervening story about the widespread effort to provide attractive new housing for the city’s rising professional class that craved greener spaces to the east. As MacKay indicates in his preface, Gardens of Eden “introduces figures in Long Island history who have either been overlooked or have received scant attention in the past: community builders who were visionaries, realtors, and financiers intent on transforming their industries; publishers and railroad executives who saw possibilities in the phenomenon; and residents who were intrepid pioneers.” The volume includes a total of 19 distinct profiles of these communities and their developers, from a group of well-qualified authors, including Richard Guy Wilson, Commonwealth Professor of Architectural History at the University of Virginia (who looks at the genesis and evolution of Garden City), architectural historian Anne Walker (Bayberry Point), and historian Richard Welch (Brightwaters and Old Field South). MacKay himself contributes five chapters, including one which explains the larger forces which created the phenomenon and a concluding brief discussion of several “flash in the pan” projects that ultimately failed. 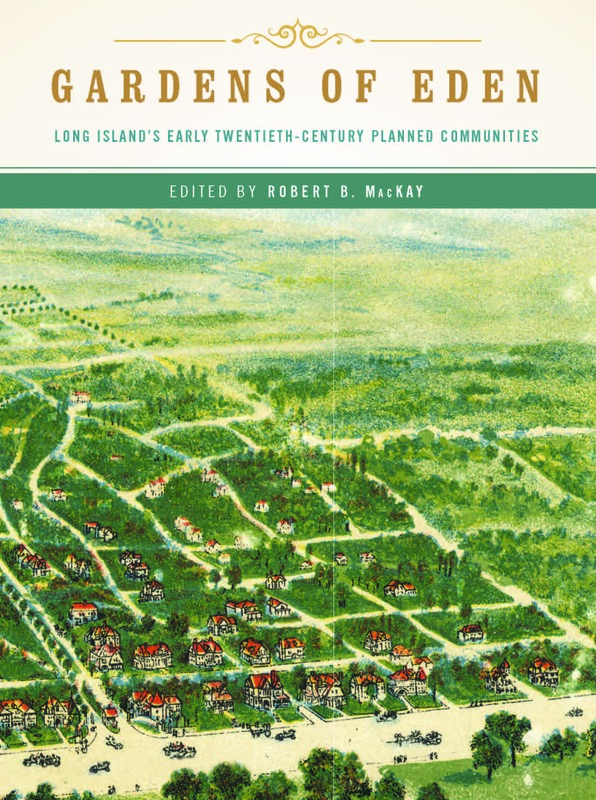 In his first chapter, MacKay makes it clear that several of the same preconditions which made Long Island the residential choice of the wealthy also appealed to builders and residents of the garden suburb movement: Long Island’s improving transportation infrastructure, which included the refinement and growth of the L.I.R.R., as well as bridges over the East River; and the ever-expanding offerings of recreational possibilities, including golf, boating, fishing, and hunting. Capitalizing on these developments were a group of real estate developers who had often cut their teeth on projects in Brooklyn and Queens and who embraced the nationwide City Beautiful program for improvement, “looking to create a framework for a better society.” These developers were assisted by advancing real estate financing conditions and a growth in New York City’s white collar class who could afford to move to these rapidly-growing green spaces. It is fascinating to see the cycles of boom and bust (often contained within the life story of a single realtor or community), the ways in which these builders focused their efforts on offering both cutting-edge modern qualities and novelties, and how they found innovative ways to market their efforts inside the pages of a very willing New York Metropolitan media. 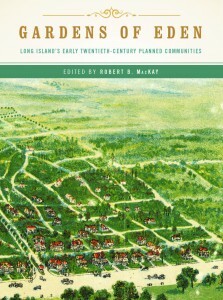 There is excellent work from the authors of this volume on developer Dean Alvord (1856-1941), builder of Prospect Park South, Cedarcroft at Greenlawn, and Roslyn Estates, who “did perhaps more than anyone to establish the standards and appearance of suburban development on Long Island at the outset of the 20th century”; the ingenious woman who designed Floral Park and Bellerose, Helen Marsh (1868-1954); the beautiful and enduring northeastern Queens enclave creations of Kensington and Douglas Manor; Great Neck Estates, the largest Long Island development of its time; and “American Venice,” the brainchild of two young immigrants who brought “winding canals, a beautiful lagoon, and imported gondolas” to Copiague in the mid-1920s. Not every chapter delivers quite as interestingly and as thoughtfully as these; chapter eight’s survey of Senator William H. Reynolds’s Long Beach suffers from an over-reliance on contemporary newspaper quotes, without enough analysis or contextualization. In general, however, much of the material is fresh, compact, interesting, and fills a significantly large gap in our understanding of how Long Island’s real estate projects of the early 20th century laid a mighty foundation for the rise of the post-World War II suburbs. As further testament to their success, many of these garden communities, including those in Kensington, Douglas Manor, Belle Terre, Roslyn Estates, and Shoreham, have remarkably stood the test of time, maintaining much of the original grace and integrity that made them popular choices early in the last century.